Hamburg, Germany is a great place to visit with your electric skateboard. It’s not only a fun city, it’s aslo the home of Mellow Boards. If you ever plan to visit it, let us know when you’ll be around and if want to go for a ride by reaching out to us via social media. Hamburg is a progressive city with open minds and open roads. Bikes are used by many, despite the not always awesome weather, so there are plenty of bike paths. The pedestrians share the sidewalk and cars are polite in the street. Try to be as cordial and respectful, doing as locals do by patiently waiting for green lights and using crosswalks. Life and culture are teeming in this city full of parks, bars, art, parties and plenty of frank, friendly people. 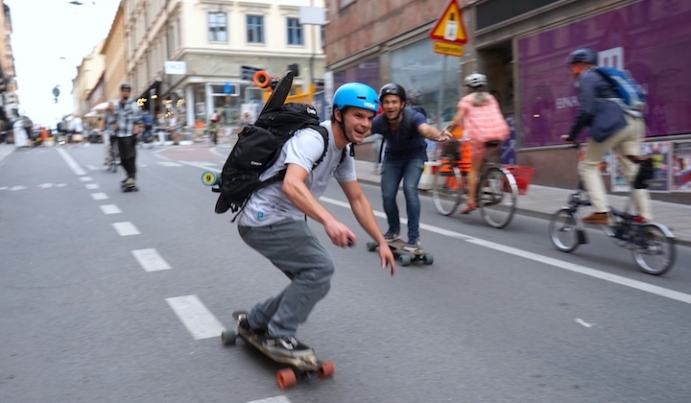 So book your ticket, read this electric skateboard guide & get Hamburgered! This is a family-and-friends kinda spot. Perfect for a Friday afternoon session with a picnic or a couple Astras. Take turns letting your friends try your board on the wide trails through a peaceful park with fountains and plenty of greenery. There is even an ice skating rink that you can blast around with your fellow electric skateboarders during the summer (it is currently under repair). Either take a break at the Japanese garden to enjoy a tea and venture out from this very central spot in St. Pauli to plenty of other cool places to grab a bite, a cool Bier or even charge a battery. The Hamburg ditch is like no other. It’s not exactly (or at all) a technically legal spot to ride, but let’s just say you wouldn’t be the first and will probably be in good company if you go. You are going to want to park here and get over the fence on the right. After a quick fence hop, walk toward the train overpass and you will find it. This place is what e-skate dreams are made of with huge banking slopes, making for an oversized skate park. You can really get some speed and get a glimpse of what thunder-boarding parks of the future might be like. The only problem is the ditch is dirty: drainage pipes lead there, bored teens break bottles and throw rocks. So be prepared to clean up the place a bit before if you want to ride this spot to it’s full potential - even with a broom, you’ll still need a waterproof board and electric drive like a Mellow that can take some sprays. Situated to the west of the port, this enchanting park is down by the water above the Elbe River with a view on the shipyards. It’s great for long runs on the asphalt strips. The local longboard gangs appreciate the hills for sliding but you can test your electric skateboards uphill carving capabilities here. It’s an all around great place to get some shade during hot summer days to shred some tar knowing you’re just quick cruise to the port from here. The Flora Bowl in Hamburg, Germany was constructed in 2006 behind the Rote Flora building, a former theatre where squatters have squatted in since 1987. The bowl began as a single quarter pipe that was slowly built out and made into a more complex park over the years. This is not exactly what electric skateboarding is for but hell, it’s sure fun to try when it’s not crowded. Only the most gnarly electric skateboarders with experience doing parks should try. We would recommend you mount a short board with a kicktail to your drive if you are going to stir it up in this bowl. A helmet and pads would be a good idea as well. This place is bustling with locals so jump into the mix and grab some drinks to quench your thirst and heal your wounds.